The Jones AT&T Stadium can be found in the Texas Tech University campus in Lubbock, Texas. 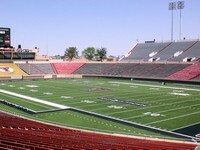 It is the Texas Tech Red Raiders’ home field. The playing field is oriented in the typical north-south configuration. The stadium opened in 1947 as the Clifford B. and Audrey Jones Stadium. The first game was between the Texas Tech and the Hardin-Simmons University. When it first opened, the stadium was able to seat 27,000. However, it 1959, it was expanded to be able to accommodate 41,500. In 1972, the stadium underwent a second expansion, which increased the seating to 53,000. On November 1, 2008, a record audience of 56,333 watched the upset of the very popular Texas Longhorns. In 2000, the stadium was renamed to Jones SBC Stadium because of naming rights agreements with the organization which provided funds for the stadium’s renovations and expansions, SBC Communications. The stadium was again renamed on April 6, 2006 to the Jones AT&T Stadium when SBC merged with AT&T. of a FieldTurf field to replace the old AstroTurf, which was cut into pieces and sold to the public.